Business Traveller takes a look at ten existing and forthcoming hotels in the vibrant Moroccan city of Marrakech. Originally one large hotel, this complex has recently been split into two separate properties to cater for a wider range of guests. The Palais Imperial has a more traditional Moroccan feel to it, while the Lounge and Spa is a modern offering, with an exhibition space featuring modern artwork and sculptures by local artists. The complex is located to the south of the modern Gueliz district of the city, and to the west of the old town, with its souks, food stalls and city walls. Both hotels share the same public facilities, which include three swimming pools (two outdoor and one indoor), L’Orangerie restaurant and Lawrence Bar, both with outdoor terraces and views of the Atlas Mountains, and extensive poolside seating. 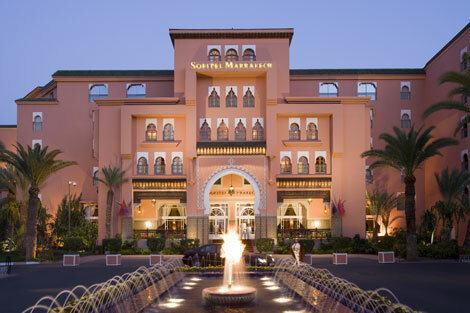 For a full review of the Sofitel Marrkech properties, click here. Situated in the same area as the Sofitel properties, this 277-room hotel features a central Andalusian garden and a large outdoor pool, with a choice of sun loungers or double-bed cabanas. Rooms are simply decorated with white walls and tiled floors, and feature chairs and a table in front of the balcony windows. There is a spa with hammam and sauna, and a traditional Moroccan cafe / bar under a canvas roof, where shishas can be hired at comfortable sofas, and where live Moroccan music is played most nights. For a full review of le Meridien N’Fis, click here. 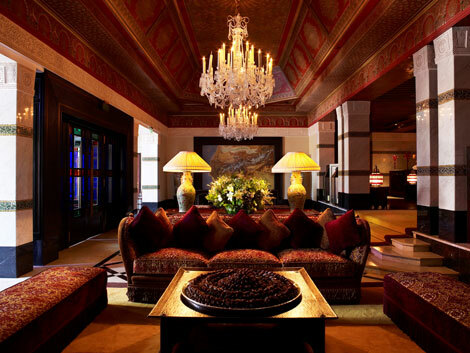 The iconic La Mamounia has welcomed famous guests including Hitchcock and Roosevelt during its illustrious history, and was a favourite of Winston Churchill. An extensive three-year restoration project under the direction of interior designer Jacques Garcia was unveiled last year, with an expanded offering of 136 rooms, 71 suites and three riads each with three bedrooms and private terraces / swimming pools. Features include four restaurants, five bars, a 27,000 square foot spa, tennis courts, and indoor and outdoor swimming pools. The grounds of La Mamounia are simply stunning and are well worth a visit even if you are not staying at the hotel – immaculately kept and serenly peaceful, they are a world away from the hustle and bustle of the streets of Marrackech outside. This 53-riad hotel officially opened on July 1, and is located a few minutes’ walk to the west of the city’s souks within Cyber Parc Moulay Abdelslam. The new-build property is one of three members of the Leading Hotels of the World group in Marrakech, the other two being La Mamounia and Hotel et Ryads Naoura Barriere. Each riad features a private courtyard, fountains, a plunge pool, roof terrace and “luxurious Moroccan furnishings”, while facilities at the hotel include two fine-dining restaurants, a 2,500sqm spa, two swimming pools and 24-hour butler service. Located about 15 minutes southwest of the city centre, Assoufid is the latest project by luxury hotel group The Rocco Forte Collection, and is due to open at the beginning of 2012. The resort complex is set among 222 hectares of palm groves, and will include 80 residential villas (each set on at least one hectare of land), an all-suite hotel wtih six bars and restaurants, tennis courts, events space, a spa, and an 18-hole championsship golf course with two driving ranges and a golf academy. Due to open later this year, this 161-room resort hotel is situated around 20 minutes north of the city centre in the Palmeraie area. 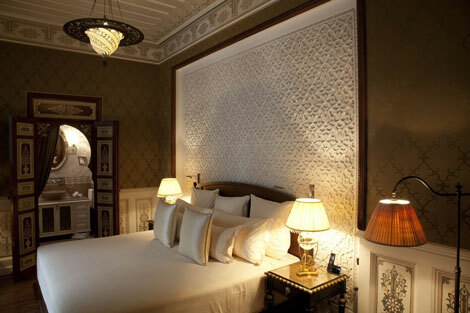 Riad-style rooms range from 80 to 200sqm, and feature terraces with views of the Atlas Mountains, gardens and palm groves. There are seven eating and dining options, including Rumi for traditional and contemporary Moroccan cuisine, The Billiard Bar with snooker table and veranda, and lounge club Fandango. Other facilities include a ballroom accommodating up to 500 guests, a 3,800sqm spa, and a 1,600sqm dark green marble swimming pool. Note: This hotel is now to be managed by Taj Hotels Resorts and Palaces – see online news June 1 for more information. Also slated for a 2010 opening, the Park Plaza Marrakech is located in the Menara district of the city, and will feature 114 rooms and suites, with facilities including restaurants, a piano bar, fitness centre, swimming pool, a disco and a bowling alley. There had also been plans for sister brand Art’otel to open a property in the city (see online news March 18, 2008), but these have now been dropped. Situated around 15km to the southeast of the city centre, the Park Hyatt Marrakech will form part of the Al Maaden Resort, a residential, golf and hotel development, with a Kyle Phillips-designed 18-hole championship course. According to Hyatt the 120-room hotel will offer “modern architectural design, rich residential interiors, creative restaurant concepts, and a lounge and elegant bar”, and will join the Hyatt Regency Casablanca as the second property by the group in Morocco. Also located within the Al Maaden development, the first African property by Starwood’s trendy W Hotels brand is due to open at the end of 2011. W Marrakech Hotel and Residences will feature 150 rooms and 68 residences, as well as signature W facilities including the Living Room lobby area and Sweat fitness centre. There will be indoor and outdoor pools, and around 1,000sqm of meeting space. Ryanair (ryanair.com) flies four-times weekly from London Luton, with Easyjet (easyjet.com) offering a daily service from the airport. Royal Air Maroc (royalairmaroc.com) flies daily from London Heathrow while its subsidiary Atlas Blue flies twice-daily from London Gatwick. Ryanair also flies twice-weekly from both Bristol and Edinburgh, while Easyjet flies three-times weekly from Manchester. Frommer’s recently published its “Day by Day” guide to Marrakech, with excellent information on the best sights, restaurants and nightlife in the city, as well as a brief history and useful phrases. The book also suggests walking tours of the souks and other popular areas of the city, and has a pouch with a fold-out map showing the main streets. I used this guidebook during a recent visit and would highly recommended it, although other brands including Time Out, Lonely Planet, Rough Guides, AA, Footprint, Eyewitness, Hg2 and Berlitz also publish guides to the city. Any Marrakech hotels you’d like to add to this list, either existing or forthcoming? Have your say by leaving a comment below.